Super Lice Fighters Lice Clinics of America Rockville: One Year!! One year ago today we were finally finished working on the clinic and just had to set everything up. I was going to savor it - it was exciting - and our planned opening day was May 1st with a possible soft opening the week before. Then the phone rang. Someone had heard about us and they were desperate. They had been treating unsuccessfully with OTC treatments and couldn't take it anymore. They were wondering if I could possibly see them tomorrow. I stood there looking around at the mess and said, "Absolutely we can see you tomorrow!!" Our new open date was now April 21st and I had about 11 hours to get the shop ready. It was a good push for us because even though I knew I could do it and was so excited - I was still nervous. We had put in so much work to get to this point and a small part of me was putting off taking that final leap. I was so happy we got that call because it was the greatest leap ever! It has been an amazing first year. I love what we do. Every day we get to help people deal with something that no one wants to deal with. Something that totally stresses people out. Something that can just break you as a parent. I know because I was there. After I got over the initial, "Oh my gosh we have bugs" it was the combing day in and day out that broke me. The worry I just wasn't getting it all and we were going to be dealing with this forever. And then you read stuff online and it can make you crazy. Now we get to help people with the real cure for head lice; without using any chemicals. I love knowing that as they leave and say, "Liz it has been great meeting you but I hope I never see you again." that wish can actually be fulfilled because there is no tedious follow-up required of them. Some washing and house cleaning and life is back to normal. 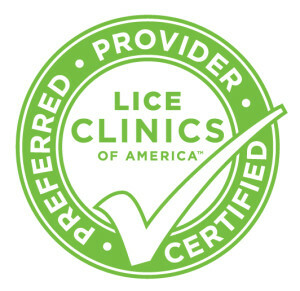 All of this has made such a wonderful first year as Lice Clinics of America Rockville. We are the Super Lice Fighters!! I wake up happy every morning knowing that I love what I do and love that we can provide such an exceptional service to our community. As a child my dad told me all the time, "Find something you love to do and you will never work a day in your life." It may have taken me some time but I finally did it and he was so right!! All of us are looking forward to our second year and our second clinic. New and exciting things are happening all the time all while meeting new and exciting people each day.